This entry was posted on 26th November 2015 by The Salon Look Girl. Every year we all pour our efforts into combatting the most prominent signs of ageing, the dreaded fine lines and wrinkles. But there is a new act in town. Hyperpigmentation, which causes skin discolouration and uneven skin tone, may soon surpass wrinkles as the most frustrating sign of skin ageing. Believe it or not, studies have shown that an unbalanced skin tone can make a person look more that 12 years older. Never fear though, with a bit of knowledge behind you and the right products you can help keep hyperpigmentation at bay. Simple answer, it’s an over production of melanin in the skin. When produced at regular levels, melanin is what colours our skin, hair and eyes. But certain triggers can lead to overstimulation and a darker colour than our normal skin tone. Unprotected sun exposure, hormonal factors and trauma or scarring are all common triggers. What can be done to reduce its appearance? Regardless of the cause, hyperpigmentation and brown spots can be as stubborn to remove as red wine on a cream carpet. That said, let me share with you the best ways to treat brown spots. You know I’m always an advocate for at home remedies, but it never hurts to get a professional’s advice. Knowledge is power people, and your skin expert will have bucket loads of great advice and nuggets of invaluable information to help you combat hyperpigmentation. Try to find a Dermalogica Skin Expert, as their face-mapping technique will help you to find out your own personal triggers for hyperpigmentation and help you discover the best products for the job. Spending 30 minutes in the sun without proper sun protection can undo a month’s worth of effort in the fight against hyperpigmentation. UV exposure plays a key role in all hyperpigmentation issues so make sure you protect your skin. Sunscreen helps prevent UV light from bringing new spots to the surface and helps control the colour intensity of spots. There’s no need to add yet another product to your routine though. All Dermalogica moisturisers contain SPF so you can both hydrate your skin and protect it in one go. Try Dermalogica Sheer Tint SPF20 40ml £34. Wear it daily, or you’ll stunt any treatment you try. To safely and properly address brown spots, look for products that contain Retinol and specific peptides that help treat and prevent hyperpigmentation for skin brightening. Look out for Red and Brown Algae too, as they can help to enhance luminosity, refine skin tone and control the processes that contribute to hyperpigmentation. Dermalogica’s Powerbright TRX system features all these key ingredients in three products that can work with any skin regime. 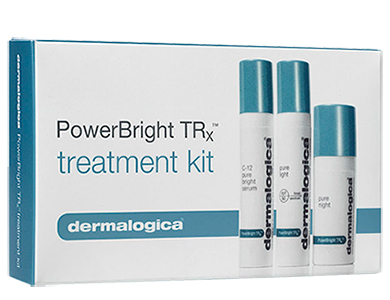 Try the Powerbright TRX Treatment Kit £33.70. This convenient travel-sized kit features all three PowerBright TRx™ treatment formulas, designed to help control and prevent factors that contribute to uneven skin tone. After cleansing, apply C-12 Pure Bright Serum directly to areas of uneven skin tone. Wait one minute for all the product to absorb. Follow with Pure Light SPF50 during the day and Pure Night during the evening. Remember, there is no quick fix for brown spots. Traditionally, it takes at least 30 days of treatment (with SPF use!) before you see any real progress. Sometimes, spots can even look darker before they lighten, as you exfoliate and they begin to surface. Continued use of products and the Dermalogica Powerbright TRX system in particular can help spots start to fade. So stick with it and I promise you’ll see results.